While many people claim every January that they are going to exercise more, a lot of them give up after the first couple of months. It takes a great deal of effort to make it to the gym before work or have the energy to go afterward. So don’t make a New Year’s resolution you know you won’t keep. Set yourself up for success by bringing the workout to you. Build your own home gym. 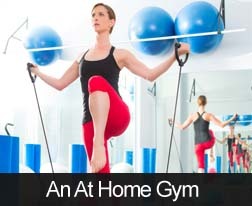 The ideal situation would be to dedicate an entire room to your new home gym. That way you can close the door, crank up the music, block out the children arguing and focus on you. However, a section of your garage or the back of your basement will also work. You just need enough room for a set of weights, a mat, a bench and a cardio machine, if you have one. Put down a rubberized floor, especially if you’re in a basement or garage with concrete surfaces. You can purchase them pretty cheaply in foot-by-foot interlocking squares. Then hang mirrors. This is important so you can watch your form when lifting weights. Also, you might want to put in a stereo system and TV for when you want to listen to music or watch instructional videos. Cardio machines can get expensive and there are many types to choose amongst. If you’re a marathon runner, then you’ll probably want a treadmill. However, you can choose as many or as few as you want, such as an elliptical, stair stepper or stationary bike. If you don’t want to break the bank for a fancy machine, then a good old jump rope will do the trick. You can go with a barbell weight system with resistance pulleys or just a set of dumbbells. Make sure you get a bench, so you can vary your lifting routine and properly stabilize yourself for certain exercises. Yoga mats are great for padding your knees, hands and back when doing abs and stretching — or for actually practicing yoga. Many people don’t take the time to stretch after a workout, but it’s extremely important in order to improve flexibility, correct posture and prevent injuries. If you create a defined plan to limber up, then it’s more likely to become a regular part of your routine.